Between now and early August, when we set sail on our journey to New York, we have an ever-growing list of tasks to get Sea Gem (and ourselves) ready for the trip. Because we're going to be putting a lot of hours on the engines during our trip, one of our preparation tasks was changing the oil. 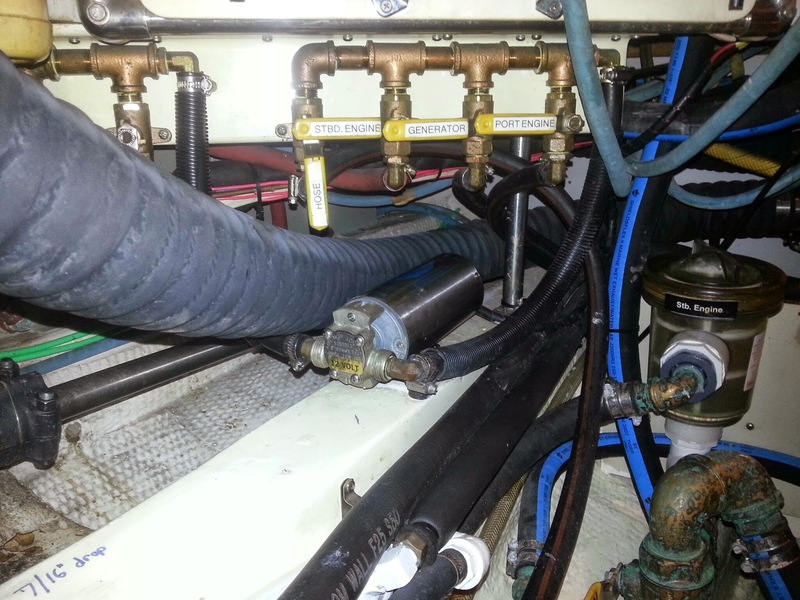 Fortunately, Sea Gem has an oil-changing system that makes changing five gallons of diesel oil in three engines (two propulsion engines and one generator) as simple and as clean as is possible. 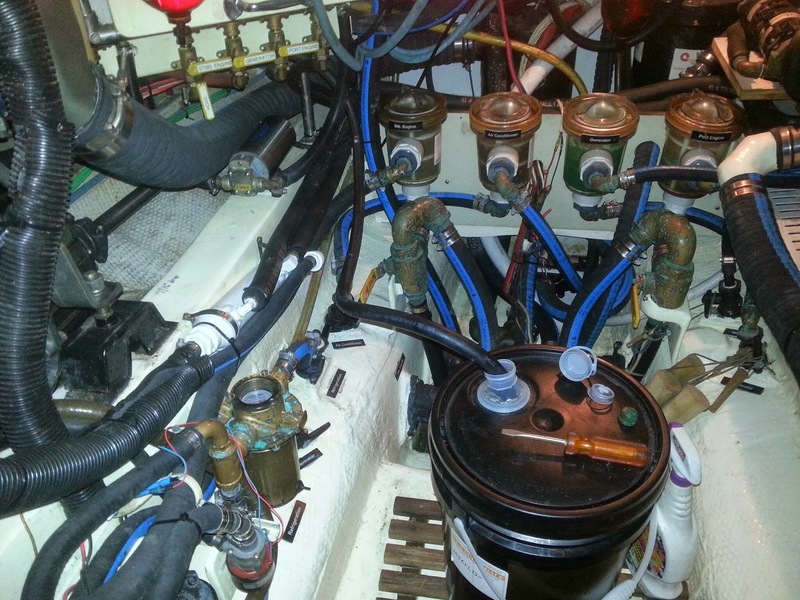 We have two 5-gallon tanks built into the engine room, one for new oil and another for dirty oil. A series of pipes and valves connects each of the engines, as well as a hose, to each tank, with an electric oil pump in between. First, you pump the old oil from all three engines into the old-oil tank. This is as simple as opening the valves for the engines and the old-oil tank and flipping the switch on the electric pump. When the pump runs dry, the task is complete. Second, you insert the hose into a new, 5-gallon bucket of oil (prior to Sea Gem, I had never even seen a 5-gallon bucket of oil), and pump the new oil from the bucket into the new-oil tank. Finally, you switch the valves from the new-oil tank to the old-oil tank, and using the hose, pump the old oil (that was just removed from the engines) into the empty bucket (that previously held the new oil) for recycling. Just in case we need to change the oil while on our trip, we went ahead and bought a second 5-gallon bucket of oil and pumped it into the new-oil tank so that everything is ready for another quick oil change if needed. I wish changing the oil in our boat were as simple! At least we only have one engine. I think the hardest part was lugging all of the oil down our pier.